The Ides of March are under-celebrated as far as I’m concerned. And those who are condemned to repeat history are doomed. In honor of the Ides, I decided to plunge a couple of knives into the back of this lovely Eastman mandolin. The customer brought it to me with a previously-repaired crack in the top, and a serious buzzing that made it unplayable. Upon inspection, I found that the impact that had caused the crack had also loosened a tone bar inside the instrument. I decided the best way to go about the repair was to remove the back. A man can never have too many clamps. Having glued down the tone bar, I shored up the previously repaired crack with some nice splints. And the back is ready to go back on. Like I said, a man can never have too many clamps. And be grateful for adhesion. It’s kind of what holds everything together. This mandolin was loud and proud. Maybe loud enough to make a banjo player nervous. And it’s back in the field now doing the work that mandolins were made to do. Happy customer. Happy Fret Boss. Here’s the story of a lovely 1969 Brazilian Rosewood Martin D-28. Perhaps one of the last great garage finds of this era. A local guitar dealer found this honey in the possession of the daughter of the original owner. It was probably the most pristine guitar of its era that either of us had seen. Other than a deteriorated pick guard and the need of a neck reset, the guitar was in extremely good condition. The first two pictures are actually of my own Indian Rosewood D-28 undergoing a neck reset, but I wanted to show the jig that my friend Steve Parks gave me to help remove the neck from the joint. For both of these neck removals, I employed a new steamless process from Stewart McDonald that I was really impressed with. Here’s the Brazilian Rosewood D-28 with the neck removed and in the process of shimming the dovetail. I applied finish to the unfinished area under the original pick guard to fill in the gap and prevent future cracking. Here’s the neck set back into the joint, so the shoulders of the heel can be dimensioned to bring the neck back to the proper angle. A whole lot of careful goes into making the dovetail fit back together just right. Steady as she goes, ’til they fit together just how I want them. I’m using a form of carbon paper to test the fit. From here, I applied a new pick guard, a new saddle, and a set up. Back in the hands of Elliot Downs, owner of Wonder in Harrisonburg, VA and musical equipment trader extraordinaire. Elliot had no problem placing this guitar with a new owner in a matter of days. It was a sweet piece of work. I love my job. I was a little sad to see this one go. This is a 1930s (according to the customer) Gretsch Guitar. This guitar has been handed down through the family for three generations. Over time the sides had separated from the top and distorted out of shape. I used a couple of strategically placed quick clamps to gently manipulate the sides back into alignment with the top. There was lots of “careful” involved in this process. Don’t do this at home! Then I broke out my own custom made hide glue pot. I’ve never seen another one that I liked better. This one really holds a fine line on operating temperature, a critical consideration for traditional hide glue. I applied glue to the seams and quickly (really, very quickly) clamped the joint with several quick clamps. I then cleaned up the squeeze out and left her to dry. Grandma’s Gretsch is ready to roll on through its next 80 years. Fix your guitar. Change your life! 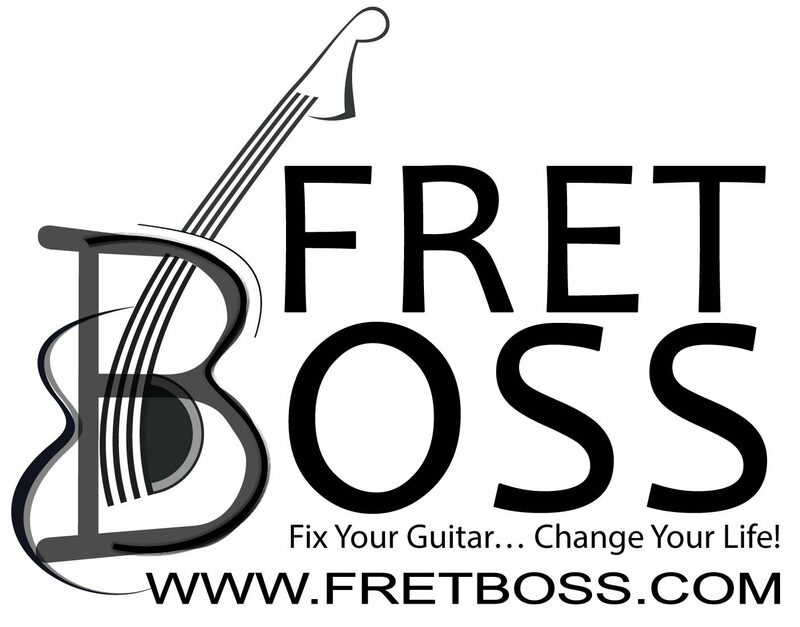 At Fret Boss Guitar Works, I work more with chisels and hide glue than with computers and social media. However, to give customers some insight into my work, I hope to use this blog to post pictures and stories of some of the more interesting jobs that come through my shop. You can also stop by the Facebook page for updates.